Last week, at SFO, while waiting for clearance to pushback from the gate, I noticed that the headrest entertainment system had crashed and was rebooting…and it was linux! I couldnt read all the messages – the bootup messages scrolled by so quickly – but there was at least one error message about not finding a config file?!? They had to reboot the system a few times before it finally booted up successfully. And yes, once booted, it stayed up and running for the entire flight to LHR. Here’s the best I could do with some rushed photos, in poor lighting, while they were telling me to turn off all electronic devices. 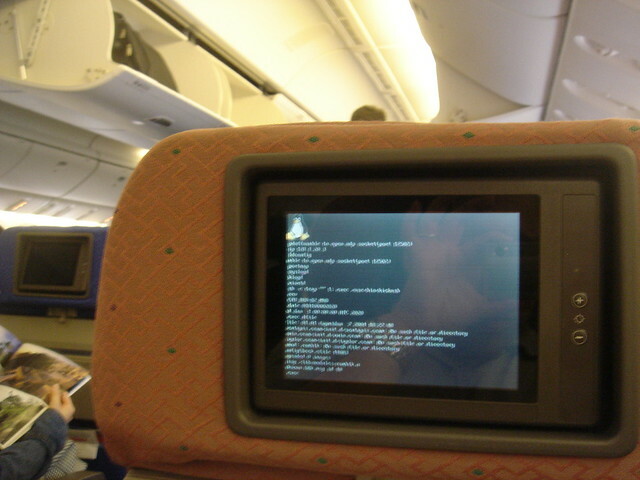 Oh, and while writing this post, I found someone else’s photo of linux booting on another Boeing 777. On a related note, years ago someone stopped by #developers and claimed that there was an in flight system that was backed by Gecko, too! I don’t think anyone ever verified it but I want to believe! Air New Zealand’s system used to run on Windows CE but switched to Linux a while ago. It appears to be the same vendor (Rockwell I think). AFAIK most of the systems run on Linux now. Next Next post: AOSA(vol2) and Mozilla’s Release Engineering: now on kindle and nook!